Me and My Doctor: Medicare & Medicaid: What is the Difference? Medicare & Medicaid: What is the Difference? Earlier this month I watched a prominent U.S. Senator — one who is very vocal about health care — confuse the terms Medicare and Medicaid three times in a five minute interview. If he gets them confused, I thought a quick review might be helpful for non-Senators as well. Medicare was passed in 1965 and signed by President Lyndon Johnson. The ceremony for the signing happened in Independence, Missouri where President Johnson sat at the table with President Harry Truman, who unsuccessfully fought for insurance for all Americans 20 years earlier. (Truman was not the first President to fight for universal coverage — the idea of a national insurance system can be traced back to Teddy Roosevelt who was President from 1901 to 1909. 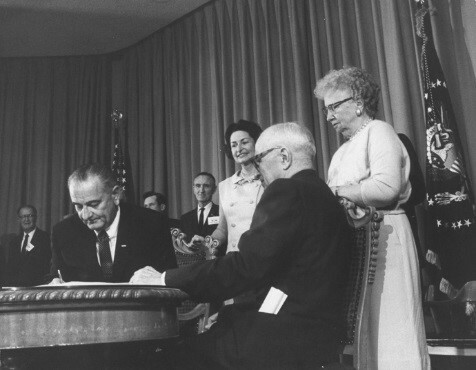 President Lyndon B. Johnson signing Medicare into law. Medicare was more limited than earlier proposals because it only covered Americans 65 years old and older, but for that population it had (and continues to have) a dramatic impact. (If that strikes you as a controversial statement, go here.) Medicare also covers a small number of people who are under 65 because they have certain disabilities. Medicare is a federal program administered by the Centers for Medicare & Medicaid Services, a part of the U.S Department of Health and Human Services. Given that the program is run on a country-wide basis, benefits do not differ by region. Medicare for people in Nevada is just like Medicare for people in New Hampshire. However, the types of coverage an individual may have might vary. (Supplemental Insurance) Although not part of the Medicare plan per se, most Americans with the financial ability to do so purchase Medicare Supplemental insurance from a private company because Medicare Part A and Part B do not cover all expenses a Medicare beneficiary will need." Part D: This is the prescription drug benefit passed under President George W. Bush in 2003. The coverage is purchased from private insurance companies to increase the number of Medicare beneficiaries who have insurance to help with drug costs (before Medicare Part D only about 25 percent of the elderly had coverage for drugs). The actual cost of Medicare Part D to taxpayers remains controversial, as does the decision to include in the underlying legislation a provision that does not allow Medicare to negotiate lower prices from pharmaceutical companies. Medicaid passed in 1965 as part of the same law President Johnson signed to create Medicare — but Medicaid is very different than Medicare. 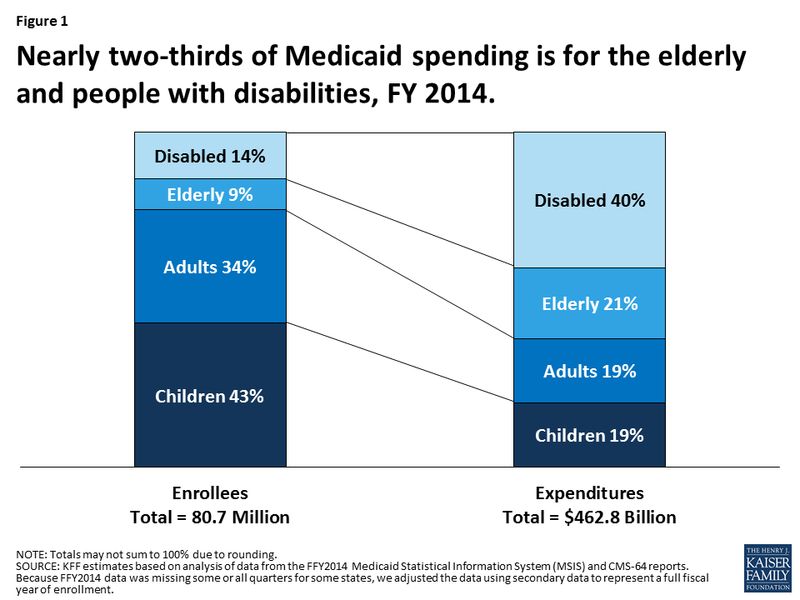 The biggest difference with Medicaid is it is a federal program run by each state. Federal money is given to the states based on actual needs and costs, matching dollar-for-dollar money spent by a state on their Medicaid population. Because Medicaid is administered by each state, the level of coverage provided, the medical services covered, and the definition of who is eligible all vary significantly (within limits imposed on the federal level). The ability of a state to control the specifics of their plan explain why “in 2011, Medicaid spending per full benefit enrollee ranged from $4,010 in Nevada to $11,091 in Massachusetts”. The original plan under the Affordable Care Act (ACA or Obamacare) was to expand Medicaid to cover all people below 138 percent of the federal poverty level (that’s a family of four living on an annual income of $31,000 or less), which also would expand coverage to non-disabled adults — a major change in many states. The ACA plan for expanding Medicaid everywhere was defeated in 2012 by the United States Supreme Court in the pivotal NFIB decision, which said every state had the right to choose whether to expand its Medicaid program under the law. That is Medicaid in a nutshell. This summer most of the debate in Congress over the fate of Obamacare really was over the fate of Medicaid. There are many people who want to change it, especially to curtail spending and increase the state’s ability to dictate the terms of their Medicaid program. 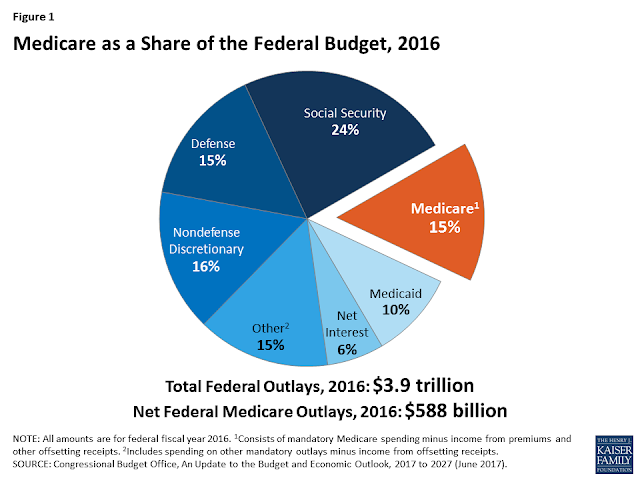 It would be easy to assume that it is Medicaid that is draining our federal coffers — so I will leave you with one more graph (and please note Social Security is the biggest social program in the pie). That ends a quick tutorial on two enormously complex programs. I hope you are now ready to speak on a Sunday morning news program without embarrassing yourself! Here is a fun timeline from Kaiser Family Foundation where you can peruse what was happening in American health care in five year increments, all the way back to the early 1900s. You might also be interested in this article which addresses whether medicine before Medicare was “The Golden Years” in American health care. Sarah Fontenot is both a nurse and an attorney. Today, as a professional speaker, she travels the country, helping people understand how health care is changing and what it means for them as consumers. Visit her website.